Can the Asus Zenbook Prime outdo its older sibling? When Ultrabooks were first introduced by Intel, one of the first models to show us that they could stand up to the gauntlet laid down by the Apple MacBook Air was the Asus Zenbook UX21. There have been plenty of other great Ultrabooks since, including the Acer Aspire S5. It hasn't taken long for Asus to supercede its older models, though, with the Zenbook UX32A appearing at the lower end of the spectrum and the Zenbook Prime UX31A as the show-off premium model. The Asus Zenbook Prime UX31A continues the styling of its predecessors, with brushed aluminium being the order of the day. The material has straight lines on the bottom housing, while the back of the screen has circles that catch the light. It's got a faintly industrial look, but it all feels impressively solid. There's no give in the build, the hinge holding the screen is nicely stiff, and it's comfortable. The Asus Zenbook Prime UX31A remains one of the best-looking Ultrabooks around. Though you can certainly see the MacBook Air's DNA in its design (especially the tapered profile and those new black, rounded keys), it maintains the look of the original Zenbook. It's a shame to be stuck with the Intel and Windows stickers on the front, but they are at least monochrome again. Intel's contribution to the Asus Zenbook Prime UX31A is a Core i7-3517U processor, running at 1.9GHz and featuring the latest Intel HD 4000 graphics. It's accompanied by 4GB of RAM, all used to power Windows 7 at this point. The most notable change in the Asus Zenbook Prime UX31A, though, is easily its screen. The UX31A boasts a 13.3-inch, 1080p IPS wonder, dwarfing its competition for resolution. Being a high-end Ultrabook, there's an SSD powering its quick boot and resume times. You get a 256GB drive in this version of the UX31A, and unfortunately, there's no way to boost that up to 512GB, no matter how many lotteries you've won. Connections-wise, Asus has included a decent selection, provided you don't mind the occasional adaptor. There's a micro HDMI port and a mini VGA port, catering for your analogue and digital video output needs. There are two USB ports - one on each side - both of which are USB 3.0. There's a headphone port and a power plug, and rounding it off is a card reader compatible with SD and, er, MMC. Just in case anyone out there's still using it, we guess. Asus has also included its ICEpower speakers, the result of a collaboration between Asus and Bang & Olufsen. 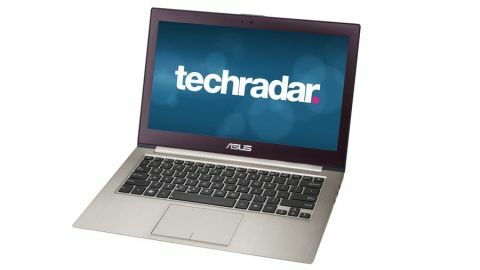 This high-end Asus Zenbook Prime UX31A is priced at around £1,500/$1,500 online, bringing it right in the firing line of Apple's highest-end MacBook Air and the Samsung Series 9. In fact, both of those two come in cheaper by default, but it's important to note that the Zenbook Prime offers a faster processor and higher resolution screen. Although Asus insists that the Zenbook Prime UX31A is a mere 9mm tall when closed, that's not entirely accurate - the body is, but it has feet to raise it off the desk and keep its vents clear. This still means it slips into small bags easily, but in reality, it stands about 2cm off a table. It is impressively light, though, coming in at about 1.2kg. There's also a lower-end version of the Asus Zenbook Prime UX31A, with a Core i5 processor, 128GB of storage and a 1600 x 900 screen, instead of the 1920 x 1080 beast in the high-end model. It comes in a fair bit cheaper. There's also the Asus Zenbook Prime UX21A, an 11.6-inch version of the Zenbook Prime that still features a 1080p display.